The DataCal Spanish language keyboard labels are a high-quality, durable and economical solution to creating a Spanish bilingual keyboard. 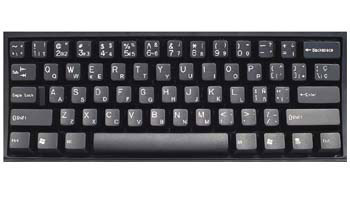 The keyboard labels are available in blue letters on clear labels and white letters on clear labels. The Spanish (Traditional Sort)label uses the Spanish keyboard layout (as used in Spain) in Windows. Thelabels are printed on clear Lexan® so the original key legend shows through;this allows you to add Spanish labels to your existing keyboard so that itbecomes a bilingual keyboard (Spanish (Traditional Sort)) and the originallanguage of your keyboard). The labels are available in blue letters on clearlabels (for beige and light colored keyboards) and white letters on clearlabels (for dark colored keyboards). This language is also available inopaque labels (white letters on black background) that will convert a keyboardto a Spanish only keyboard. This label supportskeyboard layouts for Spanish (Traditional Sort), Spanish (International Sort),Basque, Catalan, and Galician. This language issupported in Windows Vista, XP, ME, 98, and 95; if a version of Windows does nothave a Spanish language, the user can select the Spanish (Traditional) keyboardlayout. Spanish labels are a veryeconomical option for creating a bilingual Spanish keyboard. The languagelabels use an easy peel-and-stick method to install. They will not damage the original keyboard key. The letters are printedon the underside of the Spanish labels so that the lettering will not wearout. This affords you with many years of durable use. Check your keyboard to ensurethat it is compatible. DataCal bilingual labels have the letters andnumbers on the right side of the label. These labels are compatible withkeyboards that have the letters printed on the left side of the key. The labels are not compatiblewith keyboards that have the letter printing in themiddle or on the right side of the key top. The Spanish keyboard layout uses a systemof deadkeys (highlighted in yellow below) to type certain accented characters.To use the deadkey system, first type the deadkey; nothing will appear on thescreen. Next, type the key (generally a vowel) that you wish to combine with thedeadkey. You should then see the accented character that you want on the screen.If you press a deadkey and then a press a key that does not go with that accent(such as pressing an accent and the number "2"), nothing happens; theaccent deadkey must be correct to work. Depending upon the language, deadkeyswork with both unshifted and shifted keys. Many languages include more characters than canbe typed on a standard computer keyboard. To solve this problem, additionalcharacters may be assigned to the right AltGr key (the right Alt key) and/or theShifted AltGr key. In Europe, the right Alt key is referred to as the AltGr key.In the United States, it is merely the right Alt key. It is important to notethat the left Alt key cannot be used as the AltGr key. Characters that require the AltGr key appear to theleft in the DataCal labels (see illustration to the left). On the number keys,the AltGr characters are centered at the bottom of the label. Shifted AltGr keysare centered at the top of the label. For alpha keys, the AltGr characters arein the lower left corner of the label. Shifted AltGr characters (if differentfrom the lower case AltGr characters), are centered at the top of the label. This language uses the European style 102keyboard layout. This keyboard layout features a key in the lower left corner ofthe keyboard (next to the US English "Z" key) that is not found onstandard US 101 keyboards. If you are using a standard US 101 keyboard, you willnot be able to use this label. If you are using the US 101 style keyboard andwish to type the characters on the 102 key, you will have to switch back toEnglish to be able to type these characters or use the Alt key input method. To use the Alt key input method, hold down theAlt key on the keyboard and press the numbers indicated below for the desiredcharacter on the numeric keypad (note that the system only works with thenumeric keypad; it does not work with the number row across the top of thekeyboard). Many languages that use a complex script methodof input, such as Arabic, Hebrew, Punjabi, Hindi, etc., require that you typetwo or more keys in combination to product certain characters. This system isdifferent from the AltGr deadkey because it does not use the AltGr (i.e., theright Alt key) to produce the characters. To type the combination characters, first pressthe key for the first letter in the combination; nothing will display on thescreen. Next press the second letter required in the combination. When thecombination is complete, it will display on the screen. Languages use more keycombinations than can be listed here. The user should experiment with thelanguage setup in Windows to see exactly what is required to produce thenecessary characters using the key combinations.